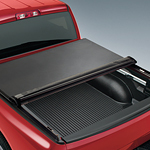 The biggest disadvantage of a tonneau cover is that it limits the amount of payload you can keep in the back of your truck since it sits flush with the top of the bed. If you are willing to work around this, then it is a sound investment. If you are looking for a quality service team to work on your truck or other vehicle, then be sure to stop on by Blue Knob Auto Sales today!